Charleston Based Dave Baker recently teamed up with “Crews Control” to help out Texas Based AMS Pictures to aid in the HD production of one of their High Quality corporate projects. 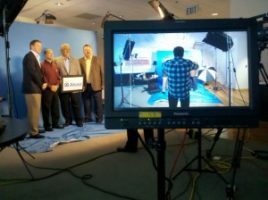 The Panasonic HDX900 combined with Kino-Flo Divas really made the subjects “Pop” in front of the blue backdrop. The Client was able to fully appreciate even the little things on Go To Team’s 17 inch HD Panasonic monitor as the subjects “Hammed it up” with some props in the edgy style that AMS is known for.